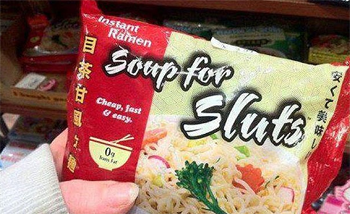 What Do The Chinese Think Of Women – Check Out The Soup! The Chinese have been described as really not very nice, they eat Dogs and Cats and recently 18 of them in Foshan city, Guandong province nonchalantly walked passed a small child who had been the victim of a hit and run, first by a van and then a car. Just the other day two year old little Yue Yue was left writhing in agony in the middle of the road as her countrymen and women stepped around her as if she was merely street litter. I was going to say they stepped around her as if she was Dogs poo but the stray Dogs in Foshan city are few and far between because they get rounded up for din dins, indeed there have been reports over the last two years that Guandong province diners are running out of their main dinner ingredients because they have eaten all the Dogs and Cats in the area. So what does a nation that has so little regard for little girls think of women, well as the title says check out the soup! If you think that the Occupy Wall Street campaigners around the world have a point just imagine what it’s like in China where there are a few very rich and billions of poor who don’t even warrant the attention of passers by if they, like two year old Yue Yue, stray away from their the pavement for a couple of minutes unnoticed by their her mother. The injustice and inequality that is so common in China is disgusting and has to end – please think about Yue Yue and the attitude of the Chinese to life the next time you want to buy something and if the item is made in China please, please think again about buying it I know I will. And just before I get off my soap box and have a lie down don’t tell me that we the consumers and voters can’t do anything about China’s inhumanity, it was because of us that China was turned from a mainly agricultural backwater into a manufacturing powerhouse, in 20 or so years, because we wanted so many shiny things. Well now the people in the towns and cities where we live could do with the jobs and that means they can’t afford their homes let alone the shiny things because they are out of work, so if you buy locally the brand names will get the message and they will bring the factories back to your country. And you never know we might just be able to send a message to China, goodness knows our politicians won’t they are too busy groveling to them.